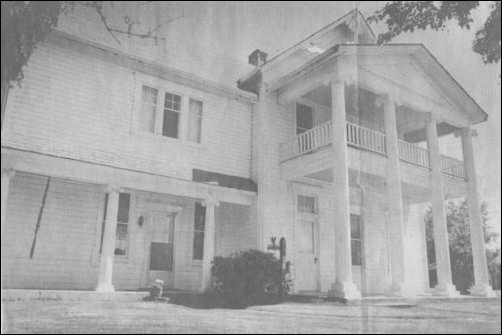 Left: This photo from the late Dona Rousseau collection shows the Minkler family's original home in Lyman. This is where the family lived before moving across (cater-corner) Main street in 1891 into what is today known as the Minkler Mansion. Right: The Beazley family, who later bought the first house, removed the top two stories. It is located at the southwest corner of Second and Main, which was the northernmost point of Otto Klement's original 1887 plat of Lyman. We have not determined when this first home was built, but we assume that it was sometime in the 1887-88 period. We have also been unsuccessful in determining why Minkler built the second home so soon after the first. Bud Meyers Jr. notes that there is some confusion over whether the Minklers actually lived in the first home. Perhaps it was built as a hotel. We hope that a reader will have an answer in family scrapbooks. In 1878 B.D. Minkler built a water-power mill on the south side of the river, and the first post office on the upper river was established at Birdsview in 1880, Mr. Minkler being the first postmaster. Indians in that vicinity always held that they were not treaty Indians, and they did not consent to the acquisition of land by the whites. A contest between these Indians and Mr. Minkler for the mill site was ultimately carried to Secretary of the Interior Hitchcock and recently decided by him in favor of the Indians. When we first began researching Minkler's history several years ago, we asked every known Minkler descendant along with descendants of the other neighboring families if they had ever heard of this land dispute. Some dismissed it as a fairy tale but most said they had never heard of it. Then we met Mike Aiken, whose mother Eleanor lost her own mother, Edith Minkler, when she was baby in 1917. Eleanor's aunt, Maude Minkler Vanderford, raised her in the Minkler mansion in Lyman. When Mike was in grade school, his family lived in the mansion and he recalled stories about the dispute but he did not know the details. Jon Jech, a fellow Sedro-Woolley alumnus and also a descendant of pioneers, gave us a copy of an authoritative book, called Valley of the Spirits, which was published in 1974. Written as a monograph by a non-Indian named June McCormick Collins, it is one of the best-researched collection of stories about the Upper Skagit Indians. Trained as an anthropologist, Collins based the book on personal interviews conducted while living with different Indian families at various times over three decades from the 1940s to 1960s. We will not confuse the reader with the complex spellings of the Upper Skagits' Lushootseed language, but we suggest that those who want to learn more should read the works by Collins, Vi Hilbert and Chief Martin J. Sampson. Collins and other sources point out that a major sub-tribe populated the area roughly between our subject area around Birdsview and Faber Ferry for hundreds of years. They lived in what was the largest extended village of the Upper Skagit group. A large wooden residential and ceremonial house was located on the north shore near Birdsview before the 1880s. Before Howard Miller's death in November 2000, we used to love to share a salmon over the barbecue at his old cabin on the north bank of the river above the Faber Ferry landing. Besides being an insurance agent, county commissioner and outdoors and hunting enthusiast, Miller spent four decades guiding serious fishermen to steelhead fishing holes on the upper Skagit. He explained that one reason for buying the land there and favoring the fishing holes immediately up and downriver from the cabin was that he learned early on that this was a favorite fishing spot for Indians going back for centuries. The tribe had been decimated by deaths due to smallpox at different times in the nineteenth century, especially in the 1830s. Another terrible outbreak occurred in 1890, when teams of white settlers were hired by the county to assist in burial of bodies in villages where nearly everyone was ill, and burning the actual village houses that were thought to be badly contaminated. Because of the deaths, some traditional Indian areas were not fully populated, which could have misled settlers such as Minkler about the Indian seasonal migration patterns. Back in 1855, when Washington Territorial Governor Isaac Stevens summoned the chief of every Puget Sound tribe to Point Elliott to sign a treaty to settle the uprisings that started that year, the Upper Skagit complied and chose a representative to attend. The appointed chief's grandson, Joseph Campbell, explained to Collins that Stevens told the Indians present that they would be given a reservation in exchange for their lands. For some reason, however, the chief was not asked to sign the treaty so he went home without signing any part. A.V. Pressentin told Collins that sometime in 1886 or afterwards, the Upper Skagit protested about encroachment on their lands around Birdsview and other upriver areas. The murder of an Upper Skagit and the resulting apprehension of a suspect, which was seen by the Indians as being high-handed, touched this off. Shortly after that, more kindling was added to the fire when a white surveyor was sent to map the Baker River area. Indians recognized a pattern in the surveyor visits: they always precluded a land grab by the whites. Karl von Pressentin hosted a council at his homestead where Indians were allowed to protest formally about what they saw as seizure, and they insisted that they had "neither signed a treaty with the United States Government to deed their lands nor received money for them." Bernhard von Pressentin paddled downriver during the night, fearing that the Indian force in more than 100 canoes threatened the settlers just as they would again in 1878. A company of soldiers responded from Vancouver. 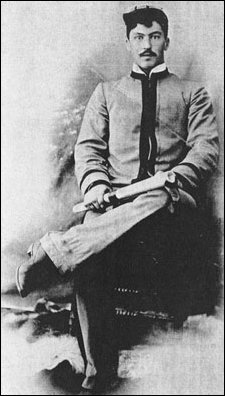 The Indians fled but the company leader, a Colonel Simmons (maybe Michael, the famous Olympia pioneer) caught up with them and explained that he could not address any wrongs, but he suggested that they apply to the Department of Justice. They did so and in 1892 some allotments were made to satisfy the Indian claims, but in general the Indians were stalled without satisfaction. By then, many Indians had given up on the system and withdrew to undisputed areas in the Suiattle River watershed. One of those allotments they received may have been parts of Minkler's property. Records are too sketchy to determine for sure. We do know that on subsequent maps of the area, a long slim piece of property on Minkler's former claim is labeled as federal land and the site of the federal fish hatchery. Joe Kemmerich, August's son, managed it for years. Another sliver is indicated as Indian land. We have found a newspaper article from the March 3, 1914, Concrete Herald, that provides some irony about Indian claim. In a brief report, we find that an Indian skeleton was dug up the week before, along with an axe and a grinding mill, by William Ackerman. 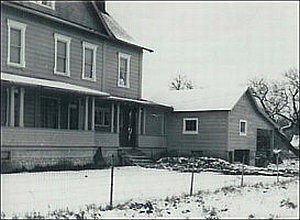 Ackerman explained that he had bought the old August Kemmerich homestead. So, Birdsey had to give up his land and Kemmerich kept his, but maybe the Indian campground was actually on Kemmerich's land? We will probably never know for sure. We made a crucial mistake years ago when the late Maxine Meyers showed us the photo on the top. Her son, Bud Meyers Jr. challenged our assumption. He is the last member of his family who has collected memories about everyone on the tree back to Clara Bartlett Cooper Flynn, the Mayflower descendant who married Lyman pioneer Henry Cooper in 1883. We concur that the top photo of is of the long-gone Commercial Avenue of Lyman, circa sometime between 1887-90. The lower photo, with the railroad tracks in front, is not of the Minkler store, but do you know what or where it was in the 1890s? Otto Klement platted the town of Lyman on Feb. 28, 1887. 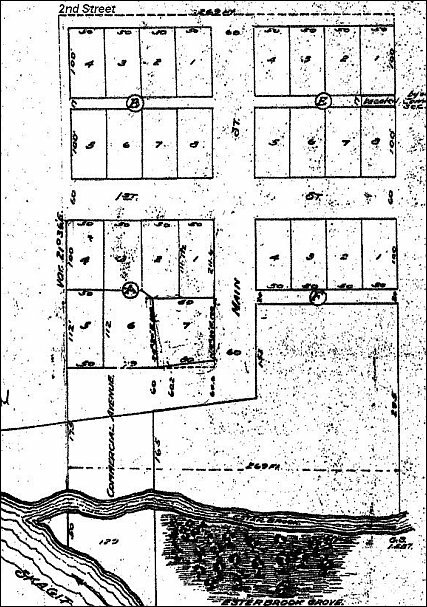 Note how the original town ended at Second Street on the north, where Mansion built both his first and second homes. The original downtown was on a dogleg curve to the west that Klement called Commercial Street. His trading post was apparently on lot 2 of that Block A. Most of Blocks A and B were washed away by the river over the next decade, as well as the "Esterbrook Grove" of trees, which was never recorded in any of the histories. Plat courtesy of Bud Meyers Jr. from his parents' collection. I originally thought that the top photo was a view looking south on Main Street, circa 1889-90, just before the railroad arrived. Bud Meyers Jr. insisted that his grandmother, Henrietta Cooper Meyers, recalled that the Cooper House in the background faced west in the 1880s, and standing there, you would look down the dogleg extension of Main Street (called Commercial Avenue on the 1887 Klement plat — see below) where the businesses of those early days were lined up east to west. Bud Meyers Jr.'s argument gained more and more logical weight, so we resolved the matter like army officers would, by walking all around the original town in June 2008, getting our visual bearings and studying the terrain. Bud Meyers Jr.'s hypothesis developed into fact, as we explain in more detail in the accompanying articles in Issue 44. In the top photo, the time period was probably 1889-90, before the Cooper home and others were turned north to face the railroad. We are indeed looking east towards the Cooper House, as Bud Meyers Jr. concluded, not south from the railroad tracks site. 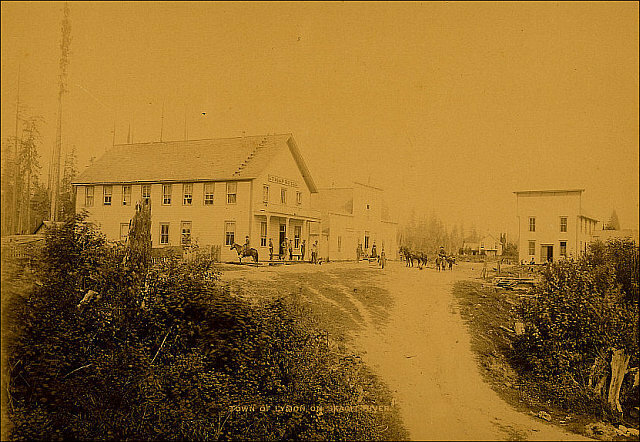 Henry Quinn's Lyman Hotel is at the far left, the second business building in town (1884) after Otto Klement's original 1881 Trading Post. Minkler's combination store and post office next to it to the right, probably pretty new since the building has replaced Klement's store. The bluff and steep bank of the river now starts just below what was his porch. The old Henry Cooper house (first in Lyman in 1883) is in the background, and it was moved north two or three times, as floodwaters ate up the bank, eventually facing the school on the north side of First Street. The Knights of Pythias Hall at the right. It was later moved north as businesses started moving to be nearer the depot after the arrival of the railroad. The gully in front at the right confused us at first, but it is actually a wagon road down the bank to the river and probably to the steamboat landing and to the ferry landing. Bud Meyers Jr.'s argument clinched it for us. The original town was oriented towards the river and travel by canoe and sternwheeler. The street disappears into the brush at the left front. That was actually the River Road, as Howard Miller explained to us years ago. It went by various names on county maps of the era: Post Road, County Highway, County Wagon-Road, etc. From the west, the road hugged the north shore of the river at Sedro, followed the bank east past the present Steelhead Club, around the Skiyou Bend, continuing along the river along what is now called the Utopia Road (called the Black Slough Road in the 1950s and '60s), past the old Williamson Hop Ranch west of Lyman and then into town. Sometime during or after the disastrous chain of floods in 1894, 1896 and 1897 floods, that River Road moved a block north to First Street on the Klement Plat, and continued east past the Klement and Meyers houses and along the north side of Jim's Slough. Click on the photo to see a much larger version of it. Minkler descendant Mary Lynne Ball (a granddaughter of John Elburn and Sarah (Thompson) Minkler), loaned the photo on the bottom and she found a caption that indicated that it was the original Minkler general store. The Ball photo presents a problem, however, because you can see railroad tracks in front of it. Could Minkler have moved that building to face the railroad tracks sometime after 1891? Or could it instead be a photo of the depot or store at Minkler Lake? Or is it another building altogether? Because records of Lyman are so scarce, we do not really know when the downtown section moved from Commercial Street, near the river, three blocks north to the north end of Main Street, near the railroad tracks. Again, we hope that a reader will have such information in a family scrapbook. As Bud Meyers Jr. discovered while studying county records, on March 31, 1886, Minkler posted a "bond for deed" for lot 7 of Block A (see plat map above), which was the location of Klement's trading post, and he completed the purchase on Feb. 28, 1887. Sometime after that, Klement moved to Mount Vernon, where he owned a hardware store. We suspect he moved in about November that year because Hannah Minkler was appointed postmaster on Nov. 26, 1887, which effectively marks the beginning of the Minkler era in Lyman. Regardless of how the dispute was adjudicated, Minkler began moving his family downriver to Lyman sometime in the 1887-88 period. In 1886 he sold his mill to George Savage for $3,000, which was paid in full by 1888. We are still researching land records and sales of the time, so our understanding of his business deals for the next ten years is based on incomplete accounts. An obituary for Birdsey in the May 20, 1911, Hamilton Herald notes that in 1886 he entered into a mill partnership with Frank Ries, "another old pioneer." We have encountered the same frustrating lack of records about the Lyman-area mills of that time that author Dennis Thompson did when he researched his excellent book, Logging Railroads of Skagit County. That frustration was compounded when the scant early records did not jive with the 1911 obituaries of Birdsey. We do know that Minkler's interests had joined with lumberman Ed English by the late 1890s to form the Lyman Lumber & Shingle Company, which changed again in name to the Hamilton Logging Company by 1908. The original Minkler and Ries shingle mill was apparently located one mile east of Lyman. That mill was sold off to partners Bixby and Triplett of Lyman in 1903. It was also apparently smaller than the main logging operation that Minkler set up later at what became Minkler Lake, about a mile and a half west of Lyman. 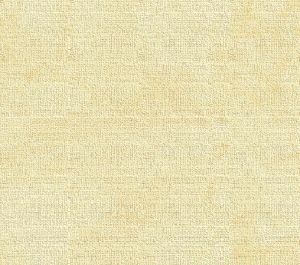 We will discuss that mill operation below in more detail and see the two photos of the mill near the bottom of this page. This photo was taken the day that the Seattle & Northern train arrived in Hamilton for the first time in the spring of 1891. Strangely enough, considering the importance of the railroads to Lyman, we have never seen a photo there of either the S&N or the Puget Sound & Baker River railroads. We hope a reader will look in the family collection or scrapbook to see if such a photo exists or an article with a photo that can be shared. The S&N tracks and the depot were just north of town next to the Lyman-Hamilton Road, which was the first paved upriver highway, probably sometime in the 1920s. The PS&BR logging-train tracks were further north, about where Hwy. 20 was later built. The railroad brings prosperity to Lyman When Minkler moved his family to Lyman, the town was really just a wide spot in the dirt wagon-road. The Seattle & Northern railway was still about three years away, so roads such as they were consisted of dust in the summer and mud and slush in the winter, full of ruts from wagons and from logs digging trenches as they were pulled by oxen. Experienced mill operators such as Minkler and Ries went to the expense of embedding halved cedar logs across the trails and then greasing them so that logs would easily slide over what was then called a "corduroy" road. The town was originally granted a post office under the name of Lyman in 1880 after Lorenzo Lyman, a country doctor in the area, rode on horseback up to Whatcom to post the paperwork. He left town a year later to return to and the leadership mantle passed to Otto Klement, the pioneer who paddled across Puget sound to the Skagit River in 1873 and became the first semi-permanent upriver settler. The only other person to stick around for a season or two at a time prior to that was A.R. Williamson, who harvested a substantial hop farm near Child's Creek on the north shore of the river, about a mile west of future Lyman where the modern Robinson Road is. He may have just squatted there or leased property from someone else. We cannot find either a preemption claim a homestead patent for him and he died in Lyman on Nov. 6, 1883, before surveys were completed. Klement's maintained a trading post/roadhouse in Lyman that consisted of a primitive hotel and saloon, from about 1881 to 1887. He platted the town from eight acres on Henry Cooper's homestead, which was originally Valentine Adam's homestead. Minkler's capital was most welcome for investment in town and he quickly became the leader of Lyman as he was in Birdsview, while Klement moved downriver to Mount Vernon. And from Post Office records that Maxine Meyers maintained, we know that Hannah Minkler was postmaster of the town from the time that Klement moved until her death in 1893. After more than two years of rumors and starts and stops, Lyman received a railroad and a depot in 1891 when the Seattle & Northern (S&N) arrived at undetermined date that spring. Built eastward from Ship Harbor (Anacortes) to Woolley in April 1890, track layers did not stop there. They continued on to Lyman and Hamilton, where the eastern terminus was until 1900, when tracks were extended to Rockport. Although the Great Northern later owned the railroad, James J. Hill was not the original owner. 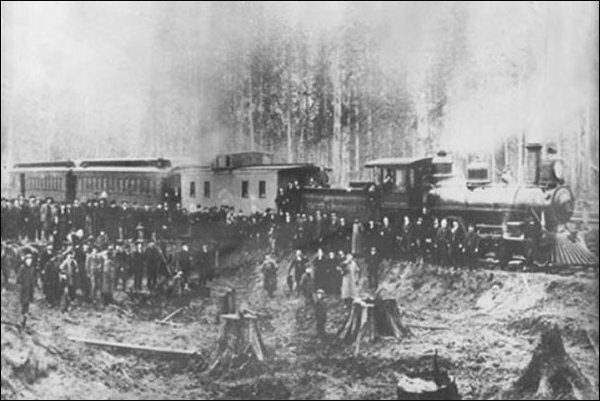 Associates of the former Northern Pacific Financier Henry Villard and his Oregon Improvement Company began the project in 1888 but quickly fell into financial trouble. A conglomerate of investors continued the line, including investors in the NP line and the Union Pacific. Hill did not acquire control until he purchased the S&N through his Seattle & Montana holding company in 1902 and it was officially called the Great Northern route in late 1906. In anticipation, or maybe the wake, of the railroad, some residents turned their houses to face north and others moved their residences and erected new business buildings north of Second Street. That initial beginning of the new downtown section was stopped proverbially in its tracks, however, as the nationwide Depression set in from 1893-96, but prosperity returned in 1897 and continued through the first two decades of the 20th century. Bud Meyers Jr. found this photo of the second Minkler home in his late parents' collection. 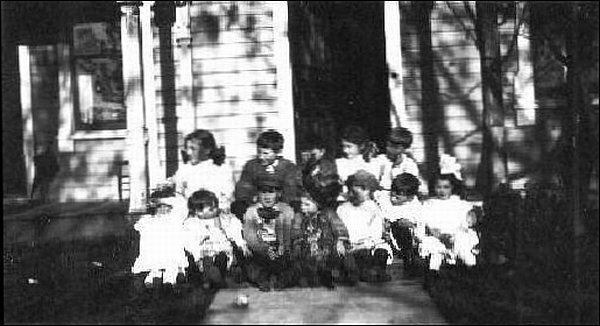 It shows a birthday party for one or more of the Minkler children and their friends, circa 1905-10, well before Maude Minkler Vanderford decided to add the pillars and a bay window to the the home and it became known, sometimes wryly, as "The Minkler Mansion." The Minkler "Mansion" Minkler built a substantial home for his growing family when they first moved to town, but by 1891 he built a second home, now known as the Minkler Mansion. Maude Minkler Vanderford and her husband, Bert, added the pillars, which now dominate the front of the house, as an affectation in the early 1920s. At the time that the family arrived, the river was at least half a mile south of where it bends north towards the bank today. We do not know where Klement's original house but we surmise that he lived somewhere near his trading post or maybe in that same building in the late '80s before he moved to Mount Vernon. 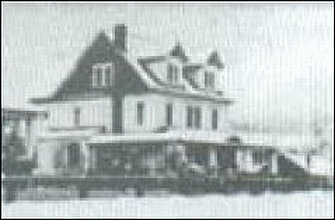 The Klement House that now dominates the bluff overlooking the river was erected in 1908. That house still belongs to the Meyers family. Henrietta Meyers, a daughter of Henry and Clara A. (Bartlett)Cooper and mother of the late Bud Meyers, bought it from Klement in 1922. Hannah Belle was apparently very happy with the move. Lyman was a bit of a backwater, compared even to Susanville where she met Birdsey. But it had some pluses, too, since it was close to the scene of county action without having all the attendant riffraff and problems of a boomtown on the rise. It was a relatively quiet lumber town, a good place to raise their kids. Starting in 1889, Hamilton was booming just five miles upriver, as was Sedro six miles downriver, where the Fairhaven & Southern Railway (F&S), the first standard gauge common carrier line north of Seattle, connected Sedro with Fairhaven, 25 miles to the northwest. Both of the boom towns were crude and rough, but wives were arriving almost daily to join and civilize their husbands and towns. The contact with so many young women from so many cities was a welcome change to Hannah and exercised her mind after 12 years of mainly talking to and about babies. We wish we could have seen her board the F&S for the hour and a half ride through forests and over hills and around country lakes. Her eyes must have glittered as she climbed down from the train and saw Fairhaven shops brimming with fitted clothes and silk from Asia. By 1890 she could afford to buy what she wanted to clothe herself and the babies and to furnish the mansion that Birdsey was building for her. She was the love of his life and he did not want to tell her no when she went on a spree. Her mother, Mrs. Lax, visited in 1890, intending to move in with the Minklers, but she disliked the climate and returned instead to Lassen County, where she bought a home in Susanville. Three more Minkler children brings total to eight After moving to Lyman, Birdsey and Hannah had three more children. The twins Ethel and Edith were born on July 12, 1888, and the baby of the family, Elmer "Punch" was born in 1891, just before the Financial Panic of 1893 that flattened commerce in the whole county and state. Those years from 1991-93 must have seemed like paradise for Hannah after ten grueling years of carrying water from Grandy Creek to the house and washing hundreds of diapers in or near the stream. Her mother, who was a widow again at 77, came up to visit the family in 1891 but did not stay long. That was the last time mother and daughter would see each other. Her husband's landslide election to the first Washington State House of Representatives in 1889-91 gave Hannah Belle a chance to travel for a week or two to the capital in Olympia and see how political wives dressed and acted as their men sorted through the constitution, amendments and acts that would shape the state in the future. She was giddy as she attended one party after another and Birdsey took her in his arms for a waltz around the floor. They were still very much in love, but she declared an end to babies after cute little Elmer arrived, the eighth and last child, and they fondly called him Punch. Luckily the sisters were old enough to shoulder the load as Hannah Belle entertained and carried on her new role as first wife of the little lumber town. Hannah Minkler's death in 1893 As she weaned little Punch, not even the ill wind from the East financial centers in 1993 could dampen Hannah's spirits. In May that year she was elated again as Birdsey announced that they would travel east of the mountains. The bigwigs of the Washington Grand Lodge of the Knights of Pythias in Yakima invited him to be an honored guest and delegate at their annual meeting. Once again she thought of shopping in Seattle in preparation for the second leg of their trip. They left Lyman on the S&N train in late May and caught the connecting Seattle & International southbound train in Woolley. Woolley was sporting a new first class hotel — well, first class for such a company town — the St. Clair, built by C.W. Waldron, the banker from booming Fairhaven. They lolled about in Seattle, but she noticed that she tired easily. She thought at first that it might have been the unseasonably hot weather, but then she felt pains that competed with those of childbirth. On May 25, she fainted at their hotel and was confined to bed. Doctors diagnosed her illness as peritonitis. The only saving grace was that she was in Seattle and Birdsey obtained the best possible medical care and 24-hour nurses. She was transferred to Providence Hospital where the sisters did everything possible to bring color to her cheeks. But on June 1 her body gave up the fight and she died with her husband seated beside her bed. She was just 36. When Birdsey arrived home with her body, he was obviously aged himself, just 44 but he imagined that he would never step lively again. Instead of feting the couple in Yakima, Knights of Pythias delegates left the convention early to attend Hannah's funeral at Lyman. Pioneer wives knelt to pray swathed in layers and layers of black dresses with bustles and petticoats underneath. Her gravesite was one of the most substantial in the cemetery west of town that the Knights of Pythias sponsored. The financial depression that had largely stopped business and trade was actually a blessing as Birdsey grieved. Without customers clamoring for immediate shipments of the best quality lumber, he could wander the woods with his friends from upriver, August Kemmerich, Karl von Pressentin, George Savage and Capt. L.A. Boyd, the men who had shared his frontier experience 10 to 15 years before. 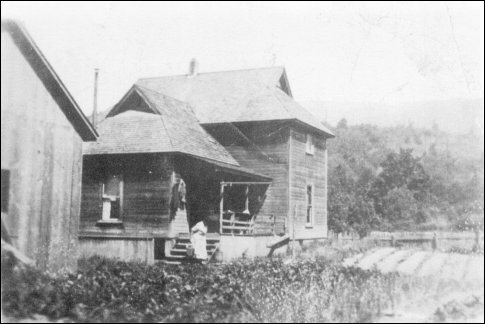 Muriel Coward Atterberry provided this photo of John Minkler's combination house and store at the eastern end of Minkler Lake, circa the 1920s. She and Ruth Atterberry Lewis remember the house well from when they grew up on the Ernest Atterberry farm, just south of the lake and the Seattle & Northern railroad tracks. The author also remembers it but as an empty derelict in the 1950s during his childhood. Back at that time, before the historical importance of such structures was realized, no one realized that this was the last remnant of the mill and town named Minkler. In 1897, Birdsey and Frank Ries joined again to build another combination lumber/shingle mill, much larger than the first one, on a lake about two miles west of Lyman. They incorporated it as part of Ed English's Lyman Lumber & Shingle Co. Over the next five years Minkler groomed his oldest son, John, to take over management of his mill property while his second oldest son, Garfield Arthur, learned business management at the University of Washington so that he could take over management of the mercantile store after his graduation in 1902. Sometime after the turn of the century, Birdsey passed management of the Lyman mill to John and Garfield. Before Birdsey's death, he made Elmer, who was 11 years younger than Garfield, a third partner in the mills. From then on, Birdsey spent less time with the mill and more time with the store and his political activities. The family applied for a post office at Minkler Lake, and the lake and town were also named for them. Because of the scarcity of records, we initially assumed that Birdsey waited to build the mill at Minkler Lake until 1897, but we have subsequently found a source that claims that the mill was built in 1887 and that John was associated with it from the beginning. We reject the earlier year for two reasons. First, John was only 11 years old in 1887. 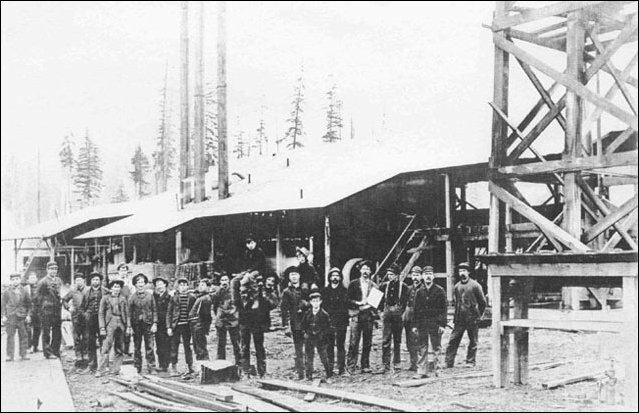 And we suspect that the Minkler Lake mill was erected or at least substantially expanded in 1897 because that is when cash poured into the county after the discovery of gold in the Klondike in 1897. Edward English, the co-founder of Mount Vernon, who was becoming a leading capitalist of the county, invested substantial new capital in the company. Back in 1891, English took over the original Decatur shingle mill at what is now Kincaid Street and the revetment in Mount Vernon and in the interim he had also become one of the leading timber men in Skagit and Snohomish counties. Bert Vanderford provided vital hands-on experience from his earlier work as the manager for Sauk City, the town that sprang up on the south side of the Skagit at the mouth of the Sauk River to be a transportation and supply point for the Monte Cristo mines. Heavy floods in 1894 and 1896 shouldered away at the Skagit riverbank near Sauk City and finally a massive flood in 1897 washed almost everything away. He also married Maude Minkler in 1902 so his timing was excellent all around. By all accounts, Vanderford became a principal in the Minkler mills, but census information shows a conflict. In 1910, Bert and Maude were living in Hamilton and he owned a confectionery store, and in 1920, they were living in Lyman, presumably at the Minkler Mansion, and he was a drugs salesman. The only time period when he apparently was a principal in the mills was from 1902-1909. That coincides with the 1906 Ilustrated History account of Lyman, which cited the "Vanderford & Minkler Shingle Mill. 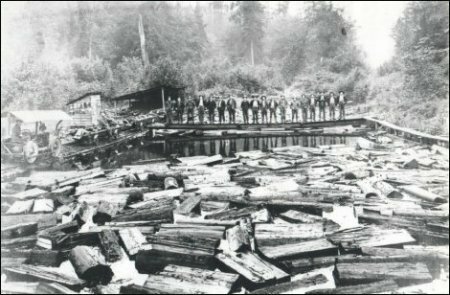 Thompson noted in his book that when the tracks for the Puget Sound & Baker River Railroad were laid next to the lake in the 1903 period, a wooden flume was erected over the tracks so that logs could be floated down from the hills to the north and dumped directly into the lake. When you drive by there, you can also see a few pilings at the eastern end of the lake that show where rail cars brought in logs and dumped them to float on the lake until they were processed at the mill. Almost all vestiges of the town of Minkler and the mill by the lake are long gone, except for those pilings. Ruth Atterberry Lewis, who grew up with her family just a mile southwest in the Utopia district, remembers a very big store at which her family did their shopping. She and her brothers and sisters loved playing in the water under the trestle of Minkler Lake for many hours at a time. She recalls that her family often walked to Lyman along the railroad tracks and she remembers that the Minkler Mill was on the left side of the track or north as they walked east to Lyman. The store was run by John Minkler and it had everything anybody living in that area would need, including food, clothing, kitchen stuff, furniture, fabric and tools. The trestle area that they played at was about 2 blocks from the store. 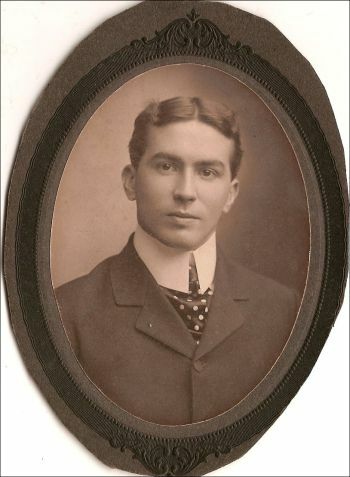 John Elburn Minkler, Birdsey's eldest son, born 1876, photographed at Vashon College, a prep school. While son John seemed to be an excellent businessman and manager, business success did not come easily for son Garfield. He did excel at athletics, however, and achieved some academic success. John graduated from Vashon College after high school. Garfield was the first Minkler child to attend a university, the University of Washington [UW]. He graduated in 1904 and in the UW yearbooks that Al Rousseau found, layouts show that he played football for the university teams of 1899-1901, at the positions of center and halfback. In more modern vernacular, he appears to have been a classic "Big Man on Campus." Living in the shadow of his successful older brother John, however, was apparently hard for Garfield. John married Sarah E. Thompson in February 1900. She was born in England, the daughter of immigrants Henry and Margaret Thompson. Known hereabouts as Uncle Henry, Thompson was a Skagit County commissioner and the namesake and principal backer of the concrete-arch bridge across the Baker River, east of Concrete. He was killed in the famous January 31, 1918, train wreck in downtown Sedro-Woolley and the bridge was dedicated in his honor by Sarah's brother, Richard, on June 15 that year. Sarah's parents settled in Birdsview in 1891, six years after immigrating, and homesteaded near the present Lake Tyee. The wedding was applauded. Family stories include one that Garfield's initial choice of a mate, however, did not thrill his father. Garfield apparently became enamored with the convent-educated daughter of a famous Seattle madam. Birdsey nipped that romance in the bud by shipping Garfield back to Omro, Wisconsin, to visit relatives in Birdsey's hometown. While back there he met Lenore Carmody and he married her on Oct. 16, 1907, in Victoria, British Columbia. Records do not indicate if his former love attended the wedding, but we do know that the match with Lenore was not made in heaven. They divorced in 1916. The store in downtown Lyman that Garfield managed sold men's clothing, shoes and hats and was pretty much a company store that outfitted the bachelor loggers at the many mills and camps in the immediate area. Its clientele was dependent on the store since travel was very limited; the roads to downriver cities were very crude in the early years of the century and the railroad and sternwheelers were the only real alternatives. 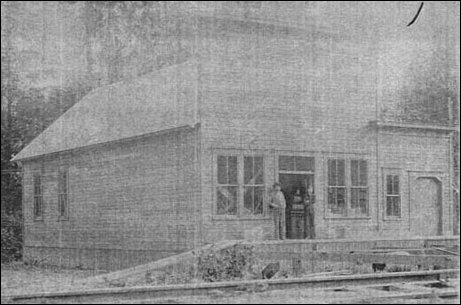 Garfield committed suicide with a carbine rifle on May 19, 1920, a week after the fire at the Minkler Lake mill, as we document in detail in our feature in Issue 52 of the online Subscribers Magazine. Garfield's obituary notes that he took over management of the store in 1908. Birdsey Minkler's second wife Only someone as successful as Birdsey could maintain a family of eight children in style during a Depression. They needed a mother and therein lies what was one of the greatest Minkler mysteries. We have read a half dozen obituaries for Birdsey and we have not found mention of his second wife in any of them. Al Rousseau, whose wife, Dona, is a great-granddaughter of Birdsey, is quite a historian himself. He was president of the Seattle Genealogical society, after studying genealogy with Robert A. Minkler, and has great respect for details. Between them, they have provided a great deal of the family facts and genealogy. Al mentioned the second Minkler wife in an aside and we searched mostly in vain for information about her for two years. The brief known story about her began in 1894 when Birdsey's family suggested that he take a vacation back to Omro, Wisconsin, to visit his family and recharge his batteries. While back there he met a 35-year-old woman named Christina Nash, who was born in the nearby town of Viroque in 1859. There was no record of the wedding and we did not know when she accompanied him back to Lyman, but Al Rousseau recalled that a deceased in-law of Birdsey once mentioned that the quick marriage after the death of Hannah Belle did not set well with some family members. Then Christina died in 1896, meaning that Birdsey lost two wives within just three years. The graves of both wives flank Birdsey's in the Lyman cemetery. Wedding bells rang often in the family around the turn of the twentieth century. Birdsey Annette Minkler married local boy Walter Kelley in 1903 and they maintained a home in Lyman. Matie made the "best catch" overall, marrying stained-glass artist Hans J. Bratlie at the Minkler mansion in April 1907. Born in Norway in 1878, Bratlie came to Hamilton in 1899 in search of his father, Julius Bratlie, who had left him and his brother in Minneapolis and "gone west" during the depression of the '90s. He found Julius in Hamilton, where he had set up as a blacksmith, mainly for John Hightower, who owned a mill and logging camps both in Sedro-Woolley and in Birdsview. The couple bought the Hamilton Herald in 1910 and then moved it to the booming cement-company town of Concrete in 1912, a year after Birdsey's death. The newspaper eventually drove its other two competitors there out of business. Hans was trained in leaded-glass design as a teenage in Minneapolis and had an artistic temperament underneath his aggressive business style. After a disastrous fire on Feb. 16, 1915, that burned much of downtown Concrete, the Bratlies sold the Herald to the first of many transient publishers until Charles Dwelley bought the paper in 1929. The Bratlies moved their family to Ridgefield in Clark County, where brother John Bratlie had bought a mill that manufactured a full line of western red cedar products. The first of the twins to marry was Edith Genevieve Minkler, who married William J. Cook in May 1909. Edith was Eleanor Aiken's mother. Eleanor's son Mike Aiken is a real estate appraiser in Mount Vernon and owns an antiques company there. He has researched the extended Minkler family and discovered that Cook was the descendant of a family in Richmond (a suburb of London), England, that has a long-heralded past. William's father was lord mayor of Richmond and we are checking to see if they were related to the ancestors of Mortimer Cook, the founder of Sedro. One of Mortimer's ancestors was reputedly the lord mayor of London at one time. Aiken has located the marriage announcement card for the Cook wedding, which notes that Billy was going to take his Minkler bride back to reside in Richmond. But instead they moved to Clear Lake, where he rose through the ranks at the Clear Lake Lumber Co. with the Lewis family. Edith was also the first of the adult Minkler children to die, succumbing to pneumonia on Sept. 8, 1917 during an epidemic. That was a great fear back during those days. In 1918 hundreds in the county died of the Spanish Flu. Their infant daughter Eleanor went to live with her Aunt Maude Vanderford at the old Minkler mansion in Lyman. Eleanor Aiken still lives in Mount Vernon and recently turned 91. Edith's twin, Ethel A. Minkler, married Richard E. Hardcastle and they moved to Anacortes and then Chehalis. We know very little about them. The last child to marry was also the youngest. Elmer D. "Punch" Minkler married Vera L. Facht in Red Bluff, California in September 1917. They wound up living in a grand old house east of the Central district of Seattle, which is still standing but in a seriously dilapidated condition. He was in the logging industry for several years before moving to Seattle in 1935, where he worked with Washington State Department of Forestry. While his children were marrying and beginning their own families, Birdsey decided to run for the Washington State Senate in 1906. Although some of his obituaries and biographies noted that he was a unanimous choice at the state Republican Convention, we discovered that there was a bit of contretemps there first. Tim I. Purdy, the historian and author who lives in Susanville, California, was a great help in tracking down Minkler information there, discovered a note in the Oct. 4, 1906, Lassen Advocate (in Susanville): "B.D. Minckler, brother of W.D. Minckler of Susanville, has been nominated for State Senator in Skagit County, Washington. The story of the Convention proceedings is decidedly interesting reading. It seems Mr. Minckler was not the machine candidate, and the bosses tried by all mean in their power to down him without avail. He won out by a good majority, after a stormy scene in the Convention, in which a demand for a recount was enforced by the delegates, after the Chairman had declared against Mr. Minckler. Many of our old residents remember Bird well, and are pleased at this evidence of his popularity." The sons and daughters of Senator B.D. Minkler, who died suddenly in Seattle last week, have planned to convert the beautiful old family home at Lyman into a refuge for the sick and needy, calling it the Minkler hospital. It was Mr. Minkler's wish that the big residence, which he built twenty years ago should be the common property of the children that they might always feel that the old home awaited them if they chose to go there to visit or to live. Since his death, however, the children have decided to convert the old home into a hospital as a memorial to their dead father. This photo shows shingle bolts floating on Minkler Lake near the mill owned by the Minkler family. Photo courtesy of the late Howard Miller. Why this hospital plan was not carried out is still a mystery and we hope a reader can help us sort it out. The ownership of the mansion in the years afterwards was also a mystery until we talked with Doris Patterson who has lived there since 1993. We know so far that at some time after Birdsey's death, some or all of the eight surviving children owned the house as a group. Maude, as the oldest, wound up living there with her husband, Bert Vanderford. She apparently lived there until her death on April 1, 1954. Many who have studied the genealogy of the family were confused as to how the house then passed on to another member of the family. Mrs. Patterson kindly helped us answer that question. After Robert A. Minkler was born to Garfield and Lenore Carmody Minkler, he was followed by twins, Frances Louise and Augusta Lenore, who was always known as Nonie. According to family genealogical records, Nonie married four times (as discovered by Deena Pittman now Mullins, not three times) the last time to Val Fields in July 1945 in Yuma, California. 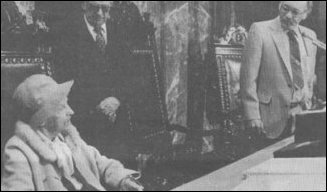 She committed suicide on March 25, 1953, and ten months afterwards, in the wake of Maude's death, widower Val Fields wound up buying the house from the other surviving Minkler children who still had an interest. He lived there for several decades and Doris is his daughter. We still know very little about Birdsey's original family after his mother moved to Susanville sometime in the 1860s, nor do we know why she waited so long to summon the boys. One of the last people that Birdsey visited on his extended tour of that area before his death was his younger brother, William. William D. Minkler was 60 and he and his family still lived in Susanville in 1911. He worked there over the years since 1873 as a surveyor, civil engineer, farmer and landowner. Although there is one record that shows a different spelling of their father's name, we have settled on Cyril as the spelling because of information that Deena Mullins found in family records. "Cyril was his grandmother's fathers name. William married a lady named Inez; they had a little boy that died when he was two years old, named Cyril. They are buried in the Susanville cemetery." Their mother died in Susanville in 1885. Mike Aiken has found documents including her obituary from an unknown newspaper. In that we learn that she married John D. Kelley on Oct. 3, 1853, in Nevada City, a town in the Sierra Nevadas mountain region. Over the next few years, they moved back and forth from California to Nevada as Kelley bought a hotel, then worked as a blacksmith, mined and final bought 1,200 acres on the Tule Confederacy east of Susanville, which could have been a religious district around the town of The Tules. Although her illness was not explained, the article notes that she traveled to San Francisco where doctors diagnosed that she "was past medical skill and could not survive long." Her funeral was conducted at the M.E. church (Methodist Episcopalian). The obituary also notes that William D. Minkler was then postmaster of the town where the newspaper was published. Other Aiken documents also note that his surviving children formed a corporation after Birdsey's death and each held shares of the combined estate. Al Rousseau literally tripped over another Minkler connection while traveling in California. While driving through Sanger on State Hwy. 180, he noticed a building called Minkler's Store. Just east of town was a wide spot in the road named Minkler. No one was there, but Al slipped a note under the door and that led to his introduction to Charles Orville Minkler. Charles was a bit of a character himself, as a telegrapher, stock raiser and cowboy, sawmill owner and aviator, having a solo flight to the Arctic Circle on his lengthy resume along with some near mishaps. An unusual go-between — his ex-daughter-in-law, has a website about genealogy and heartily suggested that I contact him when I questioned her about the California Minkler family. The short story is that he was not directly related to our Minklers, but he had an ancestor who was a relative to old Killian Minckler back in Germany. Al hoped that Charles might be a link to Mary Ann Thrall and William Minkler in Susanville, but we have not established that yet. Every Minkler should visit this spot, though, just to get the flavor of old western history and whimsy. We got to know Charles through correspondence, when he was in his early 90s and he looked like he was well on his way to being a centenarian; in 2005, he has invited us to have a piece of the cake when he blew out the candles for his centennial birthday. Thus we were sad to learn that he died in June 2007, just six months short of his Christmas birthday when he would have turned 100. Charles explained that his grandfather, Charles Ozro Minkler came to the Sanger area in 1892 and started a store/saloon/ livery stable/hotel. After discovering that saloons were not his forte, he leased it to a man named Bob Simpson, and for want of a name the village became known as Bobtown. The post office folks do not have a sense of humor, however, so they changed the township name to Minkler. Far left. 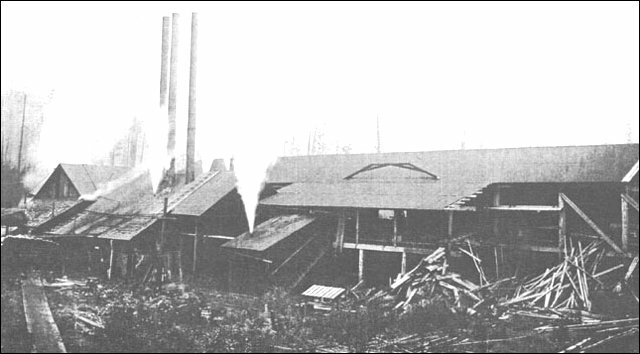 Lyman Lumber and Shingle Co. 1900, the mill at Minkler Lake. The photo was labeled with that company spelling, which was the corporate name after Ed English invested in 1899-1900. Both photos courtesy of Mary Lynne Ball, great-granddaughter of Birdsey Minkler and daughter of John Elburn and Sarah (Thompson) Minkler. Center: Photo of the mill the day after the fire in mid-May 20, 1920. Garfield Minkler in an unknown year. Photo courtesy of Minkler descendant Deena Mullins. We finally found details of the sad end to Garfield Minkler's life. The May 20, 1920, issue of the Sedro-Woolley Courier-Times reported that at 8 a.m. the day before, Garfield went to the family store in Lyman with his brothers Elmer ("Punch") and John and his brother-in-law, Bert Vanderford. He went into his office alone and moments later a shot rang out. He had shot himself with a bullet through his heart from a 401 automatic carbine. "He is said to have brooded over the loss of the mill which burned down recently," the article noted — the mill at Minkler lake. Some say he had also declared bankruptcy, but we have not discovered a record of that. Coroner Aaron Light found a long note, which detailed Garfield's worry over the financial loss from the fire. Garfield had just turned 40 and was mayor of the city at the time. His obituary in the Courier-Times noted that he enlisted for World War I and was commissioned as a captain in the U.S. Army just before the Armistice. His financial woes were complicated by his divorce from Lenore, who had remarried to George Lindley and lived in town with the three Minkler children. The obituary includes an odd item about how his marriage to Lenore was annulled, even after three children were born, and that her marriage to Lindley was also annulled. The Knights of Pythias conducted the funeral services at the Minkler mansion. The sadness was felt by the family again 33 years later when Garfield's daughter, Nonie, also committed suicide. By the way, that 1920 issue of the newspaper was the first one after the merger of the Courier and Times by Frank Evans. The mill fire is the final mystery of the Minkler family that we have not been able to solve. I recall well a day in 1999 when the late Howard Miller took me out on one of his periodic journeys and we walked around the north end of Minkler Lake near my childhood home. He pointed out the rotting pilings for the mill that still stand in the lake at the north and east end and he predicted that this was one tale that would challenge our ability to investigate: The mill burned to the ground about a week before Garfield committed suicide. Some old timers and family members blame the fire on disgruntled Wobblies, members of the Industrial Workers of the World union, who were reviled by mill owners and many local residents and revered by others. Others discount this theory because of the extreme decline in Wobbly activity in the year before the fire. We have a 1918 Courier newspaper article that recounts an organizer who was tarred and feathered and driven out of the Skagit County. In 1919, the Everett Massacre and a bloody battle between Wobblies and American Legionnaires in Centralia drove many of the union leaders out of the state and underground, so that most officers and organizers were in jail by 1920 and many had been lynched or beaten to keep them out of the woods. Miller, whose wife, Frances, grew up just a few hundred yards away from the mill, said that every Minkler he had met in his 84 years told a different story about the fire and its aftermath. The general conjecture was that the fire resulted from arson and some blamed it on teenage vandals, competitors or someone with a grudge against Garfield or the family. Elmer "Punch" Minkler worked in the lumber industry for more than a decade after the fire and during the Great Depression, he moved in 1935 to Seattle, where he worked for the Washington State Department of Forestry. He later worked in the logging equipment industry from 1942 until he retired in 1956. He died on Oct. 20, 1978, in Bellevue. We have not yet found the complete story of what John Minkler did after the fire at the mill, but we do know that he moved a couple of miles west in 1926 and had a farm and possibly a small mill on the property near Cokedale Junction until he died on July 8, 1959. His Courier-Times obituary notes that he retired when he moved there, but he was only 50. Mike Aiken, who visited John often at the later ranch, was amazed when he saw our photo of the original Birdsey homestead house at Birdsview because he recalled that the architecture was so similar to John's home at Cokedale Junction. Sarah survived John by 19 years, moving to Seattle right after his death and then died in Fresno, California at age 98 in 1978. The last Minkler child lived much longer, however, as Mary Belle "Matie" Minkler Bratlie died at age 109 in 1994 in Ridgefield, Washington. I remember John as an elderly man when I was in grade school. Our farm was just a mile south of John's original home near the lake and his old barn still stands near the junction of the Minkler Highway and Hwy. 20, where my brother and I played as kids. When I rode my bicycle past John's ranch he would sometimes call me in for a lemonade. I wish I had listened more closely to his tales. Return to Chapter 1 of the amazing Minkler story and his early years in Wisconsin and California, along with details of his 1911 funeral.